Soviet single-engine single-seat supersonic jet fighter. The Mikoyan-Gurevich MiG-19 (NATO reporting name: "Farmer") is a Soviet second-generation, single-seat, twin jet-engine fighter aircraft. It was the first Soviet production aircraft capable of supersonic speeds in level flight. A comparable U.S. "Century Series" fighter was the North American F-100 Super Sabre, although the MiG-19 would primarily oppose the more modern McDonnell Douglas F-4 Phantom II and Republic F-105 Thunderchief over North Vietnam. Furthermore, the North American YF-100 Super Sabre prototype appeared approximately one year after the MiG-19 (first prototype flights for the two aircraft were May 25, 1953 and May 27, 1952, respectively), making the MiG-19 the first operational supersonic jet in the world. On 20 April 1951, OKB-155 was given the order to develop the MiG-17 into a new fighter called "I-340", which was to be powered by two Mikulin AM-5 non-afterburning jet engines (a scaled-down version of the Mikulin AM-3) with 19.6 kN (4,410 lbf) of thrust. The I-340 was supposed to attain 1,160 km/h (725 mph, Mach 0.97) at 2,000 m (6,562 ft), 1,080 km/h (675 mph, Mach 1.0) at 10,000 m (32,808 ft), climb to 10,000 m (32,808 ft) in 2.9 minutes, and have a service ceiling of no less than 17,500 m (57,415 ft). 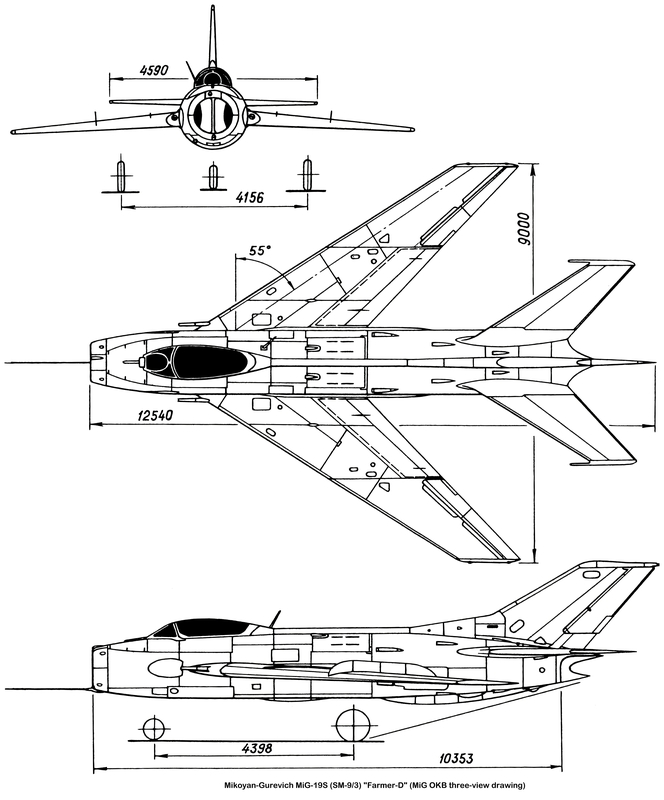 The new fighter, internally designated "SM-1", was designed around the "SI-02" airframe (a MiG-17 prototype) modified to accept two engines in a side-by-side arrangement and was completed in March 1952. The prototype suffered from poor cockpit pressurization and the engines proved temperamental with frequent flameouts and surges with rapid throttle movements. The engines were upgraded to the AM-5A standard with 21.1 kN (4,740 lbf) of thrust each, which exceeded the power output of the Klimov VK-1F in afterburner while providing better fuel economy. The SM-1 was barely supersonic, reaching 1,193 km/h (745 mph) at 5,000 m (16,404 ft) Mach 1.03. This performance was deemed insufficient for the new supersonic fighter and an afterburning version of the engine, the AM-5F, was proposed. While not implemented, the AM-5F served as the basis for the Tumansky RD-9 which powered production aircraft. Further development of the twin-engine concept resulted in a government request for the "I-360", internally designated "SM-2", which was also powered by the AM-5F engines, but featured a highly swept wing. SM-2 (I-360) was built in 1952 and, compared to SM-1, had 1.6 m longer fuselage, wingspan reduced from 9.26 m to 9.04 m, and weight increased from 5,219 kg to 6,802 kg. SM-2 also had a new 55° wing. N-37D guns were placed in wing roots to open space in a nose for the radar. Cockpit and landing gear were redesigned, and low vertical stabilizer increased in size. In April 1952 first prototype was sent to LII, with first flight on May 27, 1952 by G. A. Sedov. It was immediately clear that AM-5A engines were not powerful enough, and they were replaced with AM-5F [2150 kg/2700 kg with afterburners]. New engines allowed for Mach 1.19 in horizontal flight. As a result of testing air brakes and control surfaces were slightly modified, with new aircraft receiving designation SM-2A, and then after additional modifications SM-2B. Second prototype, SM-2/2 had modified tail, a low-positioned horizontal stabilizers instead of T-tail, and guns with shorter barrels. However, the AM-5F was still not considered powerful enough, and both prototypes received yet more powerful AM-9B 2,600 kg/3,250 kg with afterburners. A serialized version of that engine was designated RD-9B. With the new engine, SM-2B received the designation SM-9/1, first flight on January 5, 1954, by G. A. Sedov, who made a total of 132 flights. Final changes included modified air intake, new NP-23 guns with 340 rounds, radio RSIU-3M "Klen", responder "Uzel-1", and radio-range-finder SRDM-1M "Konus." The Soviet of The Ministers of the Soviet Union issued an order #286-133 to start serial production on February 17, 1954 at the factories in Gorkiy and Novosibirsk. Factory trials were completed on September 12, 1954, and government trials started on September 30. Initial enthusiasm for the aircraft was dampened by several problems. The most alarming of these was the danger of a midair explosion due to overheating of the fuselage fuel tanks located between the engines. Deployment of airbrakes at high speeds caused a high-g pitch-up. Elevators lacked authority at supersonic speeds. The high landing speed of 230 km/h (145 mph), compared to 160 km/h (100 mph) for the MiG-15, combined with absence of a two-seat trainer version, slowed pilot transition to the type. Handling problems were addressed with the second prototype, "SM-9/2", which added a third ventral airbrake and introduced all-moving tailplanes with a damper to prevent pilot-induced oscillations at subsonic speeds. It flew on 16 September 1954, and entered production as the MiG-19S. Approximately 5,500 MiG-19's were produced, first in the USSR and in Czechoslovakia as the Avia S-105, but mainly in the People's Republic of China as the Shenyang J-6. The aircraft saw service with a number of other national air forces, including those of Cuba, North Vietnam, Egypt, Pakistan, and North Korea. The aircraft saw combat during the Vietnam War, the 1967 Six Day War, and the 1971 Bangladesh War. All Soviet-built MiG-19 variants are single-seaters only. Although the Chinese developed the JJ-6 trainer version of the Shenyang J-6, the Soviets believed that the MiG-19's handling was easy enough no special conversion trainer was needed, other than the UTI MiG-15. In the USSR, the MiG-19 Farmer was superseded by the MiG-21 Fishbed. The Shenyang J-6 remained a staple of the Chinese People's Liberation Army Air Force until the 1980's and has also been developed into the Nanchang Q-5 (NATO reporting name "Fantan") attack aircraft. 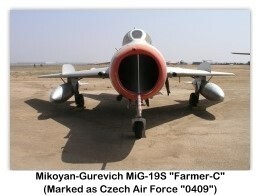 Despite its age, the MiG-19 Farmer and its descendants exhibit good handling characteristics at low altitude and a surprisingly high rate of climb, and their heavy cannon armament, a one-second burst from three 30 mm NR-30 cannons had a projectile mass of 18 kg (40 lb), makes them formidable adversaries in close combat. Russian built MiG-19's are still in service in North Korea, Myanmar (Burma), and Zambia. During their service with Soviet Anti-Air Defense and in East Germany, MiG-19's were involved in multiple intercepts of Western reconnaissance aircraft. 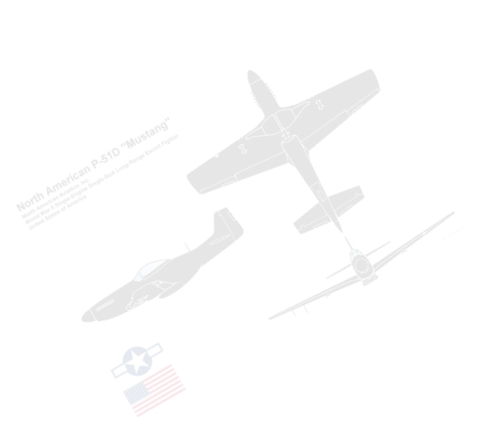 The first documented encounter with a Lockheed U-2 took place in the autumn of 1957. The MiG-19 pilot reported seeing the aircraft, but could not make up the 2,234 m (7,000 ft) difference in altitude. When Francis Gary Powers's U-2 was shot down in the 1960 incident, one pursuing MiG-19P was also hit by the salvo of S-75 Dvina (NATO: SA-2 "Guideline") missiles, killing the pilot Sergei Safronov. In a highly controversial incident, on 1 July 1960, a MiG-19 shot down an Boeing RB-47H Stratojet (s/n 53-4281) reconnaissance aircraft in international airspace over the Arctic Circle with four of the crew killed and two captured by the Soviets. They were released in 1961. In another incident, on 28 January 1964, a MiG-19 shot down a North American Rockwell T-39 Sabreliner which had strayed into East German airspace while on a training mission; all three crewmembers were killed. In early 1969, Hanoi made the decision to strengthen its air defenses by creating a third jet fighter unit; the 925th Fighter Regiment. This unit would consist of late model MiG-17's and the newly acquired MiG-19's (nearly all of which were J-6's from the People's Republic of China (PRC)). The regiment was established at Yen Bai, and by April 1969, nine combat-rated MiG-19 pilots were posted for combat duty. While some of North Vietnam's MiG-17's and nearly all of their MiG-21's were supplied by the Soviet Union, the bulk of their MiG-19's (J-6 models) were supplied by the PRC, which seldom exceeded 54 MiG-19's in number. The first use and loss of a U.S. fighter to a MiG-19 (J-6) was in 1965 when a USAF Lockheed F-104 Starfighter piloted by LTC Philip E. Smith was attacked by a People's Liberation Army Air Force aircraft near Hainan Island. His Starfighter took cannon fire which damaged a portion of his wing and missile mount. Smith gave chase and did receive missile tone on the MiG but, within a millisecond of pressing his missile firing button, his Starfighter lost all power. He ejected and was captured. Smith was held prisoner until released in 1972, coincidentally during U.S. President Richard Nixon's visit to China in 1972. According to another source, Smith was released in 1973. The North Vietnamese Air Force used the MiG-19 much later in the air war than the MiG-17 and the MiG-21. Despite their limited numbers, MiG-19's were involved in extensive combat during Operations LineBacker 1 and LineBacker 2 (aka the Christmas Bombing). The NVAF claimed only seven victories over U.S. aircraft, using the MiG-19, all of which were F-4 Phantom II's. Primarily because of the aircraft's twin engines, which created a maintenance nightmare, the MiG-19 was not favored by North Vietnamese pilots. While the MiG-17 had maneuverability and the MiG-21 had speed, the MiG-19 had a combination of both, but not to the same degree as the others. North Vietnam used the MiG-19 from 1969 until the 1980's when it was replaced by newer aircraft. The MIG-19 lacked mounts for air-to-air missiles but it had the one advantage over the early model Phantoms, it was armed with a cannon. Confirmed aerial victories by MiG-19's while assigned to the 925th FR, which match U.S. records occurred on: 10 May 1972 in which two F-4 Phantoms were shot down by MiG-19's flown by Pham Hung Son and Nguyen Manh Tung. Both NVAF victories over the F-4's were accomplished by cannon fire. Combat results of the 925th FR using MiG-19's, according to the North Vietnamese Air Force were: two F-4's on 8 May 1972; two F-4's on 10 May 1972; one F-4 on 18 May 1972; and two F-4's shot down on 23 May 1972; these losses were in exchange for 10 MiG-19's lost in aerial combat with U.S. jets. The MiG-19 did make history in one manner however; on 2 June 1972 over the skies of North Vietnam, the MiG-19 has the inauspicious honor of being the first recorded jet fighter to be shot down in aerial combat by cannon fire at supersonic speeds, by a USAF F-4 Phantom flown by Phil Handley. The MiG-19 apparently was in front line service with the PLAAF, and saw limited combat against their Nationalist adversary, the Republic of China Air Force (Nationalist China). One major air battle between Communist and Nationalist Chinese aircraft occurred in 1967, with 12 J-6's taking on four Lockheed F-104 Starfighters. Each side claimed one kill. There were reports of People's Republic of China J-6's (MiG-19's) flying combat missions during infrequent border squabbles with the Soviets, though with no records of dogfights, and encounters during the Vietnam War with U.S. aircraft that strayed into Chinese airspace. These confrontations resulted in a few shoot-downs of U.S. aircraft, with no recorded losses of Chinese aircraft, although the MiG's sometimes had to make a hasty retreat Back into Chinese airspace when the Americans flew in reinforcements. In 1962, Egyptian MiG-19's saw some action in the ground-attack role during the civil war in Yemen during the early 1960's. The first reported air combat in the Mideast with the MiG-19 was on 29 November 1966, when two Egyptian MiG-19 fighters battled Israeli Mirage IIIC's. The Israelis claimed two kills and no losses. 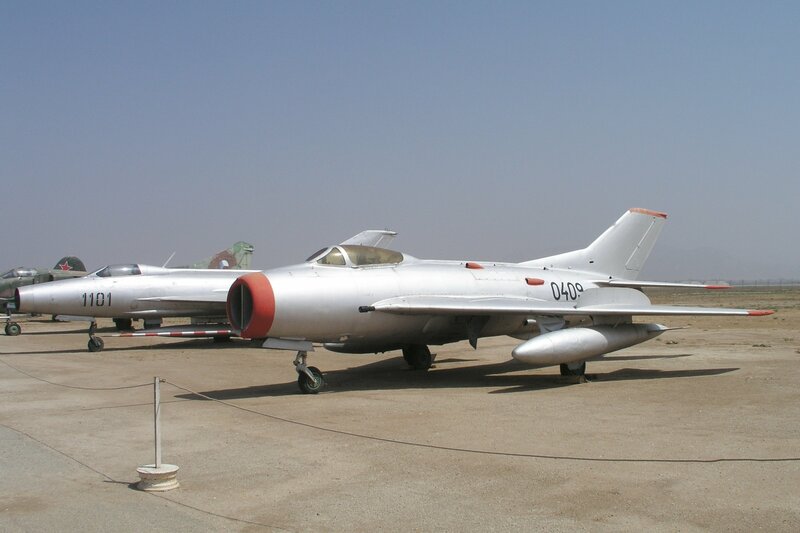 Around 80 MiG-19's were in service with Egypt during the Six-Day War in 1967, but more than half were destroyed on the ground during the opening Israeli airstrikes of Operation Focus. 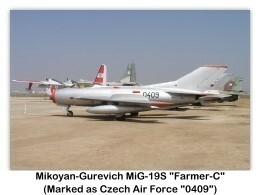 Israeli pilots, however, did find the MiG-19 a potentially dangerous adversary because of its performance, maneuverability, and heavy armament. Following the war, the Egyptians organized the surviving MiG-19 aircraft and assigned them air defense tasks of Egypt's interior. The Soviet Union did not supply Egypt with any replacement of the MiG-19's destroyed in the Six Day War, but Egypt might have received some from Syria and Iraq, so that by the end of 1968 there were 80+ MiG-19's in service with the Egyptian Air Force (EAF). The aircraft also saw combat during the War of Attrition; in one engagement on 19 May 1969, a MiG-19 aircraft engaged two Israeli Mirages, shooting down one with cannon fire while the other escaped. Egypt had around 60 Mig-19's in service during the Yom Kippur War of 1973 in which they served as close support aircraft. The Iraqis obtained some MiG-19S fighters in the early 1960's, but later sold them all off (a couple remaining in local museums), though the survivors did see some action against the Kurds in the 1960's. It is claimed that the Iranians acquired a batch of their own F-6's. 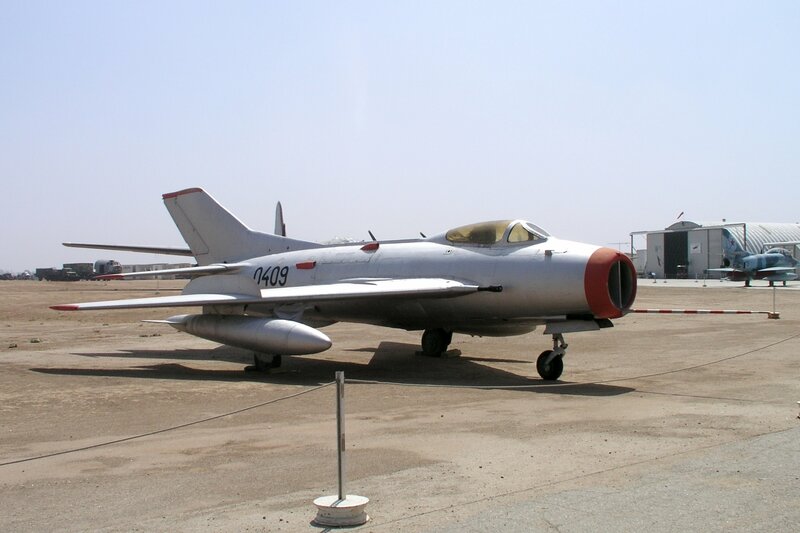 Tanzania flew MiG-19S fighters against Uganda during the war between the two states in 1978 and 1979, while the Sudan used its MiG-19S fighters against separatists in southern Sudan, with at least one shot down. 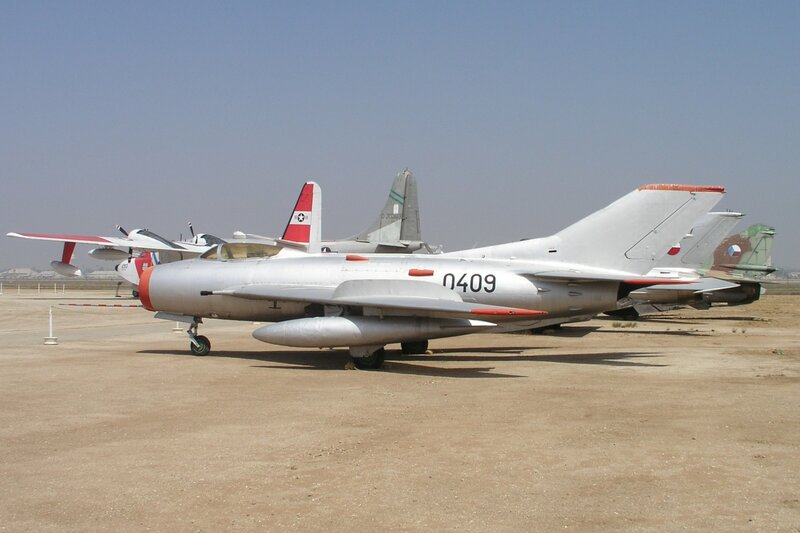 The Somalis flew the F-6 against rebels and the Ethiopians in the 1980's, though with the breakdown in civil order in Somalia all their aircraft ended up derelict by the early 1990's. MiG-19 Farmer-A (SM-9/1): First production version armed with 3 × 23 mm NR-23 cannons. MiG-19P Farmer-B (SM-7): Version equipped with RP-1 Izumrud radar in the nose and armed with 2 × 23 mm NR-23 (later 2 × 30 mm NR-30) cannons in the wings. Had provision for an unguided rocket pack under each wing, elongated tailfin fillet, all-moving tailplane, third airbrake added behind the ventral fin. Vympel K-13 (AA-2 'Atoll') air-to-air missile (AAM) capability was added late in its service life; entered production in 1955. MiG-19PG: MiG-19P equipped with the Gorizont-1 ground control datalink. MiG-19S Farmer-C (SM-9/3): Further development equipped with Svod long-range navigation receiver and armed with 3 × 30 mm NR-30 cannons. Had provisions for an unguided rocket pack or a FAB-250 bomb under each wing; entered service in 1956. MiG-19R: Reconnaissance version of the MiG-19S with cameras replacing the nose cannon and powered by uprated RD-9BF-1 engines. MiG-19SF: Late production MiG-19S powered by the same uprated RD-9BF-1 engines as the MiG-19R. MiG-19SV: High-altitude version for intercepting reconnaissance balloons, reached 20,740 m (68,045 ft) on 6 December 1956; entered service in 1956. MiG-19SVK: MiG-19SV with a new wing, small increase in altitude above MiG-19SV; did not warrant production. MiG-19SU (SM-50): High-altitude version to intercept the Lockheed U-2, equipped with a self-contained liquid-fuel booster rocket pack; appears to have been abandoned because of inability to control the aircraft at very high altitudes and the aircraft's tendency to enter supersonic spins. MiG-19PF: Single-seat radar-equipped, all-weather interceptor fighter aircraft; built in small numbers. MiG-19PM Farmer-E: Variant with removed cannons, armed with 4 × Kaliningrad K-5M (NATO: AA-1 "Alkali") beam-riding missiles. Entered production in 1957. MiG-19PML: MiG-19PM with Lazur ground control datalink. 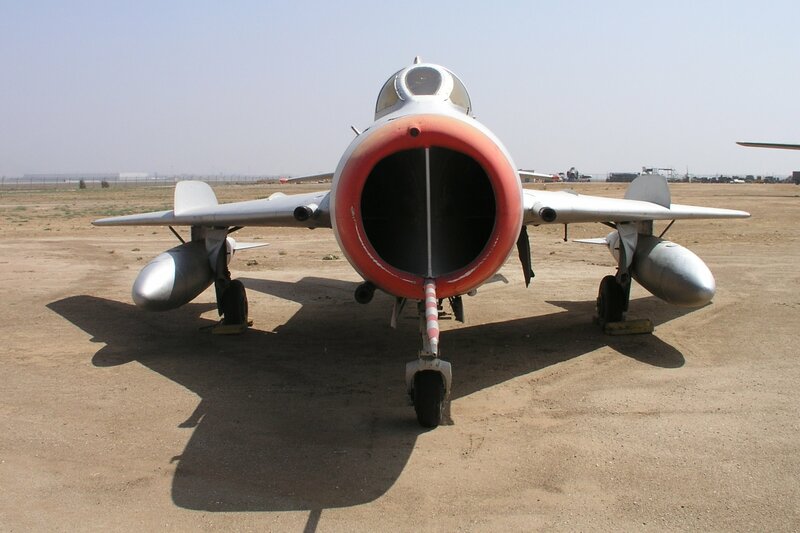 MiG-19PU: Rocket pack fit similar to MiG-19SU. MiG-19PT: A single MiG-19P equipped to carry Vympel K-13 (AA-2 "Atoll") missiles. MiG-19M: Target drone converted from the MiG-19 and MiG-19S. SM-6: Two MiG-19P's converted to flying laboratories for testing the Grushin K-6 developmental AAM (intended for the Sukhoi T-3 jet fighter) and Almaz-3 radar. 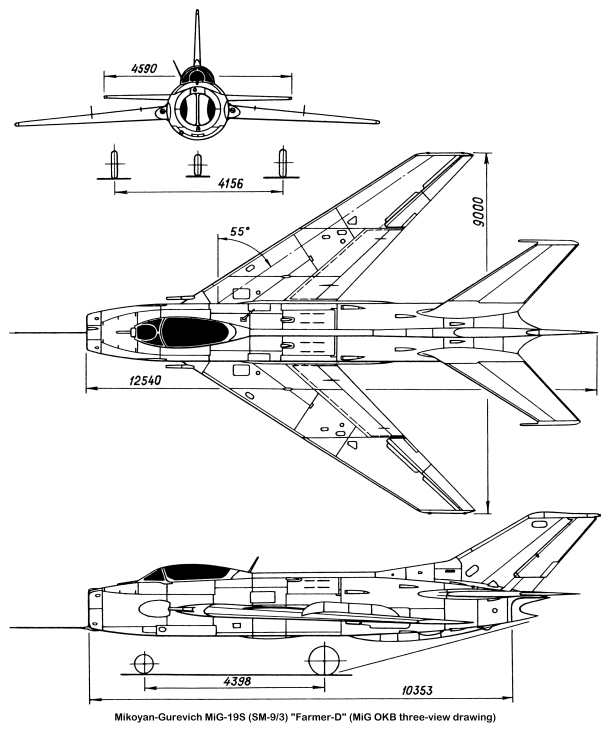 SM-12: New fighter prototype, developed into the MiG-21; four aircraft built. SM-20: Missile simulator for testing the Raduga Kh-20 (AS-3 "Kangaroo") cruise missile. SM-30: Zero-length launch (ZEL) version with PRD-22 booster rocket. SM-K: Missile simulator for testing the Raduga K-10 (AS-2 "Kipper") cruise missile. Avia S-105: Czechoslovak licensed built MiG-19S. Shenyang J-6: Chinese-built version of the MiG-19. This version was inducted into the Pakistani Air Force as the F-6. The F-6 was later modified by the Pakistani Air Force to carry U.S.-built AIM-9 Sidewinder missiles. Afghanistan: Afghan Air Force. 36 acquired by the Royal Afghan Air Force from 1964. Albania: Albanian Air Force. (85) Mainly Chinese Shenyang J-6. All retired in 2005. Bulgaria: The MiG-19 served in the Bulgarian Air Force from 1958 to 1973. People's Republic of China: Chinese-built variant Shenyang J-6, all single-seaters retired from frontline combat service in 1992, except for Nanchang Q-5 variant, some J-6 was converted to target/attack drone (number not confirmed). As of 2010 all were decommissioned. 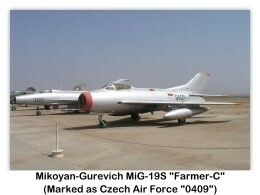 Czechoslovakia: Czechoslovak Air Force operated many MIG-19S, MIG-19P, MIG-19PM and licensed build S-105. Indonesia: The Indonesian Air Force acquired a number of MiG-19S in 1961 and used during the preparation of Operation TRIKORA in 1962, (the taking of Western New Guinea from the Netherlands) in Western New Guinea (now, Papua and Papua Barat); several of these aircraft crashed. The MiG-19S was removed from Indonesian service in 1970. North Korea: North Korean Air Force. J-6 still in service. Pakistan: Pakistan Air Force. All retired in 2002. Some of them are on display on squares in various cities. Poland: Polish Air Force. A total of 22 MiG-19P and 14 MiG-19PM interceptors served between 1957 and 1974. Romania: Romanian Air Force. 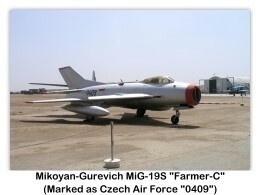 A total of 17 MiG-19P and 10 MiG-19PM aircraft were in service between 1958 (1959 for the PM) and 1972.